This Thanos Rising review was made after playing the game three times. 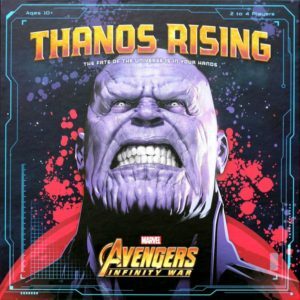 Thanos Rising is a cooperative dice and card game based on the popular Avengers: Infinity War film. You’ll be attempting to defeat a certain number of villains before Thanos is able to get the six Infinity Stones he needs to power the Infinity Gauntlet. Thanos Rising was designed by Andrew Wolf and is published by USAopoly. To begin a game of Thanos Rising, each player will choose a Team Base card. The Team Base card will show your team’s starting hero, your starting dice pool, and your team’s unique ability. At the start of your turn, you’ll choose which of the three sectors you want your team of heroes to go to. You’ll pick a sector based on the heroes and villains that are there. You might want to go recruit more heroes to get better abilities or you might want to do some damage to one or more of the villains there. After you’ve chosen a sector, you’ll roll Thanos’ two dice, the Infinity Stone Die and the Thanos Die. The Infinity Stone Die shows which Infinity Stone disk gains a counter; if one of the disks ends up with five counters on it, Thanos has gained that Infinity Stone and is that much closer to being able to power the Infinity Gauntlet. The Thanos Die could make Thanos move to a different sector, activate villains in different sectors, or it could make you reroll the Infinity Stone Die. 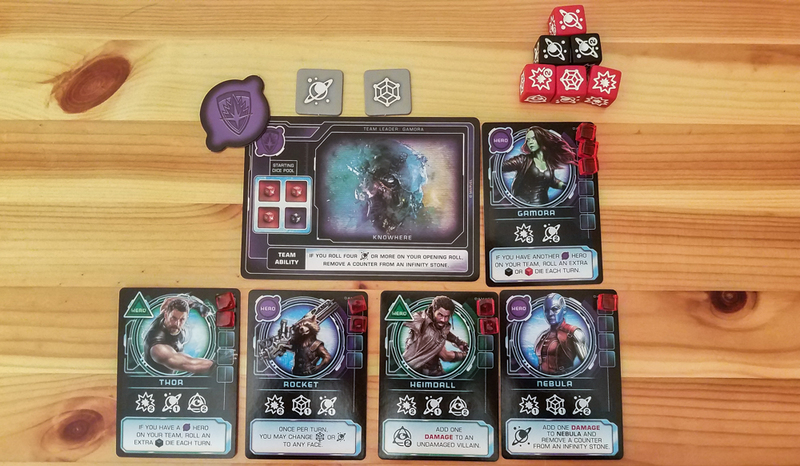 After you’ve resolved Thanos’ dice, he’ll do one damage to all heroes in his sector, including heroes on your team if you happen to be there. The villains in that sector will also activate. After Thanos is done doing his thing, you’ll roll all of your dice, including any extra dice from other heroes on your team. The game uses a Yahtzee-style mechanic, allowing you to place one or more dice, reroll, place more dice, and so on. There are four different types of dice, each with a different mix of icons on them. You’re trying to match the icons shown on the hero and villain cards in your current sector. If you match all of the icons on a villain card, you’ll add a damage counter to it (or remove it if it’s defeated) and you’ll gain one bonus token. If you match all of a hero’s icons, that hero is added to your team. You might also end up with heroes on your team that have abilities that can be triggered when you assign dice to them. You can use bonus tokens on anyone’s turn. Most of them have icons on them, but there are also some tokens that remove counters and some that give you extra dice to roll. You’ll win the game if you’re able to defeat a certain number of villains based on the difficulty level you chose. You’ll lose if 10+ heroes are defeated, if one team has no heroes at the end of a turn, or if Thanos gets all six Infinity Stones. My favorite part of the game is deciding which sector to send my team to. I think those are the most interesting decisions you make because you have to figure out which set of three cards has the most potential value. You might see that one sector has two heroes that could greatly benefit your team while another sector has one or two very powerful enemies that could potentially take out multiple heroes. It’s fun building your team of heroes. Right away you know you need to get a hero matching your team leader’s affiliation so you can get an extra die, but after that you can choose how you want to build your team. You’ll usually end up with at least one hero who you weren’t necessarily going after but who does end up adding some value to your team. I like the overall look of Thanos Rising. The character portraits look great on the cards, the Thanos figure is cool and detailed, and the Infinity Gauntlet is very nice. The bonus tokens are great. Not only can they help you when you roll poorly, they also give you a way to help out your teammates on their turns. I believe every single major character from the movie is in this game. That’s pretty awesome. 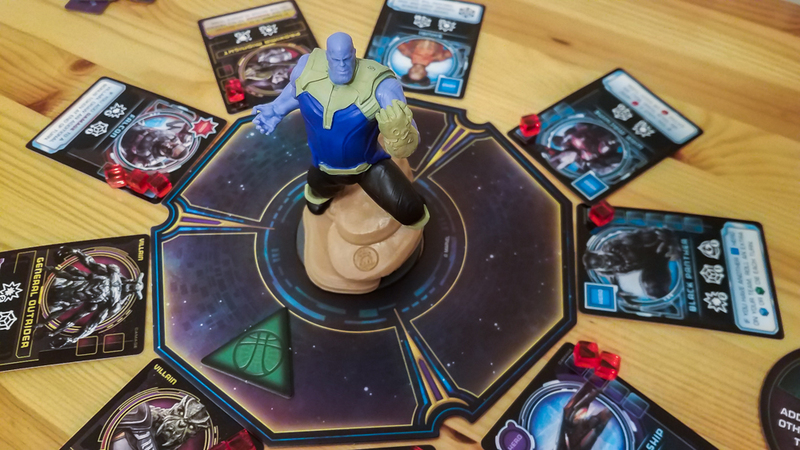 Thanos Rising is extremely easy to learn how to play, which is why I think it works great as a family game. It’s barely a step up from games like Forbidden Island, so just about anyone can learn how to play it quickly. I wish there were more unique hero powers and I wish the powers that are in the game all made thematic sense. Hulk’s power makes sense—the more damage he takes the stronger he gets—but it seems like a lot of the powers were randomly assigned. As you might expect in a game with a ton of dice rolling, there is a lot of randomness in Thanos Rising. If you get really lucky with your dice rolls, you feel minimal satisfaction when you gain a hero or defeat a villain because it doesn’t really feel earned. If you’re really unlucky, you could end up having a frustrating experience. Some games can feel very long, especially the ones you end up winning. Not only do turns start to feel samey after about 30 minutes, you also have to wait for the villains to show up, which means you might have to go through nearly the entire deck before you even get a chance to defeat the last one. At that point you just want the game to end. This isn’t always going to be an issue, but it was for my group in two of our three games. You could run into quarterbacking issues since every bit of information is out there for everyone to see. 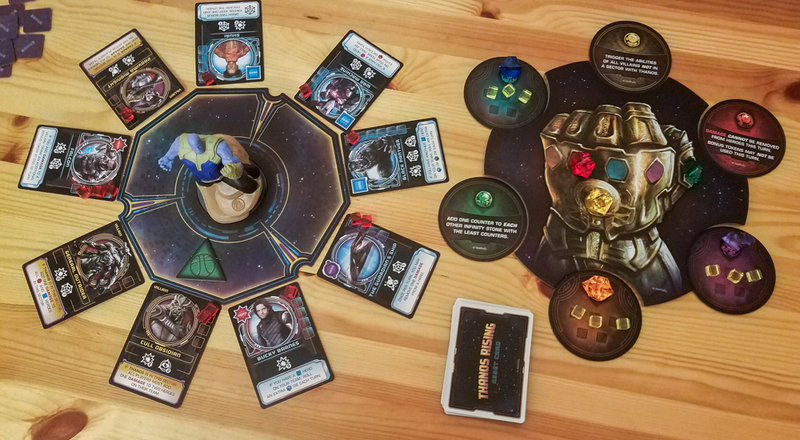 Thanos Rising has not been a big hit for my group because we found that there’s just a bit too much randomness for it to be a consistently fun experience. No one outright disliked it, though. I’d personally rather play Elder Sign or Hotshots if I wanted to play a thematic, Yahtzee-style cooperative game. I do think Thanos Rising could be a huge hit as a family game or as a gateway game for fans of the Marvel universe. I especially think families with younger kids will have a blast playing it because they won’t care about the randomness or that some of heroes share powers. They’ll just be excited to be able to put Thor, Iron Man, Groot, and other heroes on their teams while they try to take down Thanos. Thanks for taking the time to read our Thanos Rising review! To stay updated on all things cooperative board games, follow us on Twitter, Facebook, or via RSS.